The restive workers of an electronics subcon in the Cavite EPZA, the country’s biggest export zone, have once more setup a picketline in protest at the lockout of union members and union busting. The Seung Yeun Techonology Industries Corp. (SYTIC) was supposed to have shutdown yesterday but starting last night, non-union workers went back to work at the factory. “We want our jobs back as regular workers. Management has admitted in a conciliation meeting that SYTIC has existing orders to fulfill from its multinational electronics customers for the next several months and thus there is no valid reason to shutdown. The closure of SYTIC is feigned not real, is temporary not permanent. It is just a maneuver to bust the union, deny us our regular jobs and continue its violations of labor standards on payment of wages, overtime pay, health and safety, and illegal deductions,” averred Frederick Bayot, president of the SYTIC Workers Association. 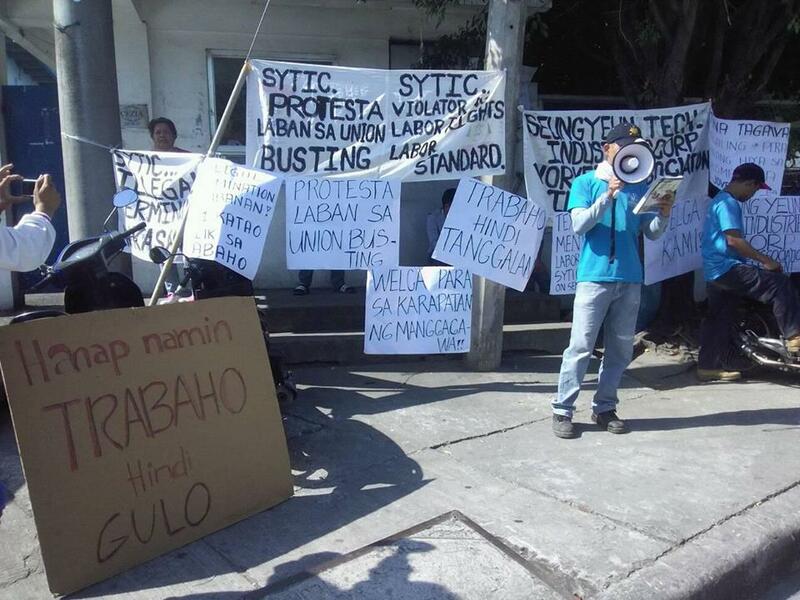 The SYTIC workers are demanding the reopening of the factory, their return to work as regular employees and recognition of the newly-formed union. They are manning a picketline round the clock to protest the illegal lockout and guard against an attempt to runaway shop. Management announced that there was no more work at the SYTIC factory starting yesterday. However, SYTIC union members refused to accept the separation pay offered by management and were escorted out of the factory while non-union workers were later allowed back to work in the night. “We won the first round of the fight. We will win the second as well,” he insisted. An earlier five-day strike in April by SYTIC workers ended in a victory with 18 workers, who were illegally terminated for union activities, reinstated back to work. However, the company later filed for permanent closure which the union is contesting is a union busting scheme. Cavite EPZA workers who participated in the Labor Day mobilizaton pledged support for the “round two” of the fight of SYTIC workers. “Ang laban ng SYTIC workers ay laban ng lahat ng EPZA workers,” insisted Rene Magtubo, chair of the militant Partido Manggagawa and its partylist nominee. The former union president of Fortune Tobacco Corp. committed to mobilize solidarity from the labor movement in the country and abroad.